Sometimes New Hope is blessed with unbelievably cute puppies! Cashew is one of those puppies that is really very hard to ignore. She was born June 2014 and is not very big (2.9 kg /6 lbs)! She’s not had a good start so that’s part of it. She’s also got a contagious mange and it’s made her pretty itchy and sick from the skin infection. It’s isolation for Cashew for a while (6 weeks until she has been given all her medication). After that we will work hard on her socialization! We don’t really know what she is but perhaps some boxer in her there. All we do know is that she deserves a break and deserves to be well and have a family of her own one day. That can happen with the Guardian’s of Hope program. 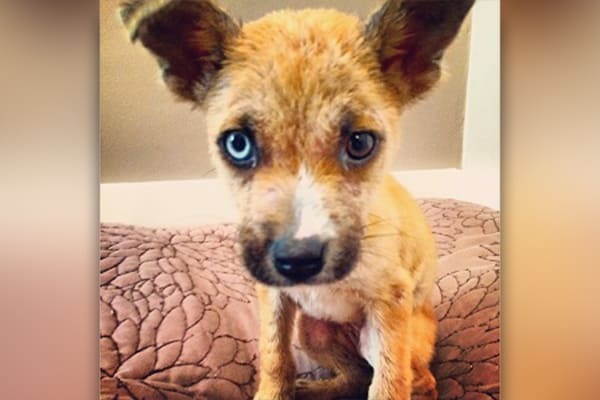 Please consider donating so that we can help Cashew and others like her. Update: Cashew’s skin is much better and she now weighs a much healthier 7.40 kilograms! This sweet girl has also been adopted! !